The inspirational pins came from here and here. 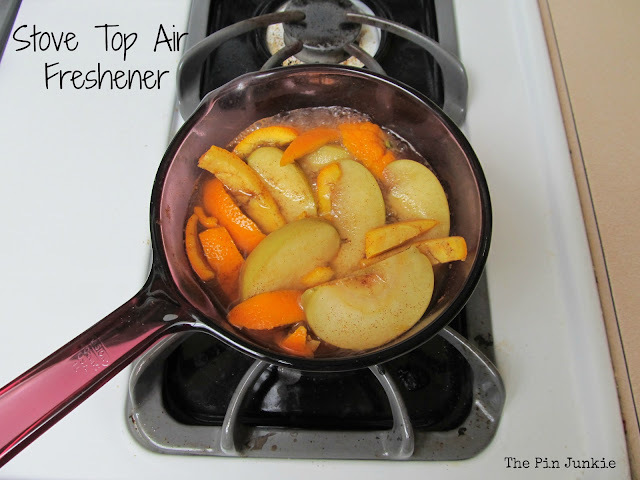 This is a really easy and all natural way to make your home smell like fall. When I did this, it smelled like I had baked an apple pie in the oven. The family noticed right away and asked what smelled so good when they got home. They were disappointed it wasn't pie! I used an apple, orange peels, and cinnamon. Just put everything in a saucepan and add some water. Bring it to a boil, then reduce the heat to a slow simmer. Check the water periodically and add more when needed. Otherwise it will burn and it won't smell nice.